The Omni Group has released to the iPad another one of their desktop apps, Omni Outliner. Great news for us big outline users, we can do it with our finger on the go. There are plenty of very nice outline apps for the iPad already on the market, so the Omni Outliner app couldn’t be a simple listing app, it has to carry many of the quick to create and customizability options the desktop version does in order to be a win. We think they may have a ‘win’ here. 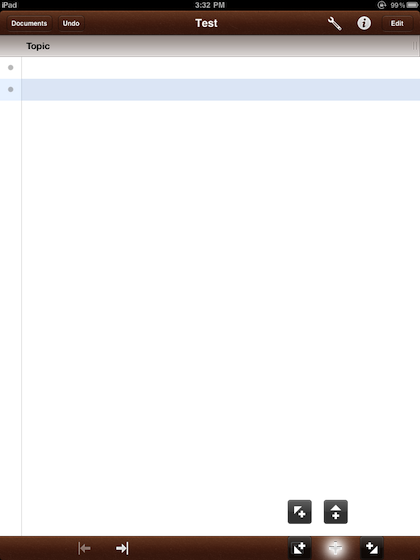 Opening a new page via the Documents area gives you a blank page. 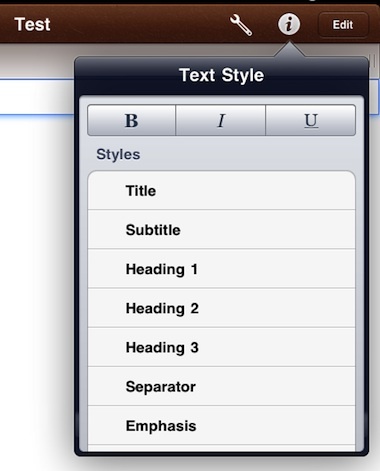 Tapping the title, your able to edit it like any other text. 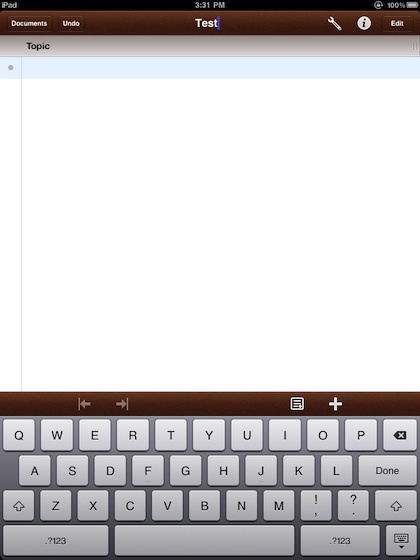 Tapping on the page takes you to editing the first line. When your done editing that line, tap the dot to the left or start another line. The dot is also your grab point to re-order the lines. The plus above the keyboard on the right will add a new line directly under the one your working on now. A handy feature we found was tap/hold on the plus. This works with the keyboard showing or not. By doing this, Omni Outliner gives you the option of where the new line will be added: Above the one your working now, above at a higher level, below at the same level or below as a child. Each line can be highly customized. While on a line, tapping the ‘i’ button will let you set the text style. The Wrench… or Settings icon takes you to the view percent as well as the ability to edit the page background and the line coloring. 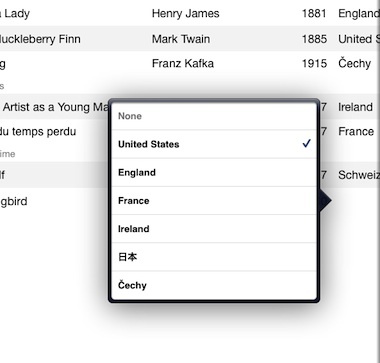 The line/row color pickers in Omni Outliner go way beyond what anyone could possibly use. 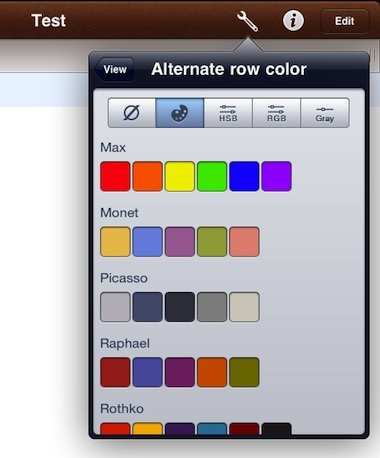 Not only are there many color groups to choose from, there are also variable adjustable color controls. While this may meet any situation we are in, it might be handy to have a group we set up that we use most often to make getting to them quicker… a feature for the next revision. 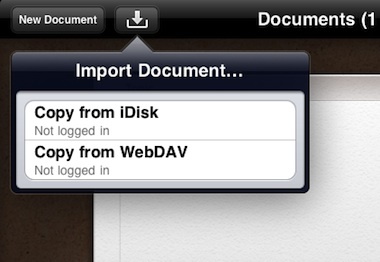 The Documents area is much like all of the other OmniGroup offerings for the iPad. You move through the Documents from side to side, with the most recent moved to the top of the list, furthest left, after each edit. When viewing the documents, you can choose along the bottom to ‘share’, create new or delete a current document. 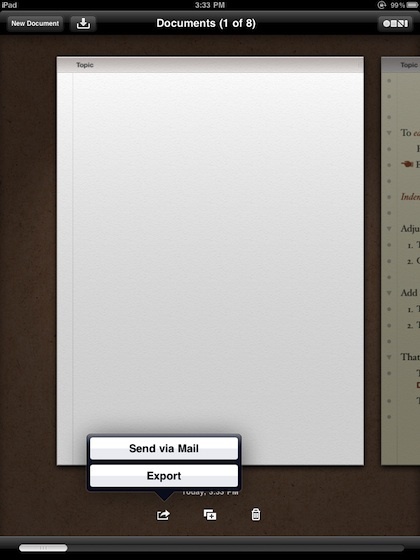 Omni Outliner offers many ways to get documents you create in/out of the iPad app. Right now, we are not seeing a sync feature like they offer on their Omni Focus product. 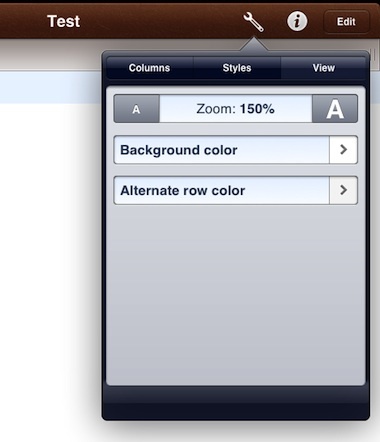 A feature that we have not seen in other outline apps is the ability to drag the column tops larger/smaller. Each column has a ‘move’ handle that you can slide. Another feature that you would normally see on a spreadsheet, but Omni Outliner offers is the ability to tap a square and have a list of used options pop up to choose from. It’s features like these that make Omni Outliner not just another Outliner app.